Shout Factory will release TENNESSEE TUXEDO AND HIS TALES: THE COMPLETE COLLECTION on March 13th and we have six clips from the classic cartoon series for all of you to check out. Tennessee, a wise-cracking penguin, and his dimwitted pal Chumley resided in the Megalopolis Zoo, where they were constantly scheming against zookeeper Stanley Livingston and his assistant Flunky in an attempt to raise the quality of zoo life. Their projects required the assistance of their educated friend, Phineas J. Whoopee , and his 3-D BB (a three-dimensional blackboard). Featuring the voice of the late, great Don Adams (who portrayed Maxwell Smart on Get Smart and later voiced Inspector Gadget), Tennessee Tuxedo And His Tales educated as well as entertained youngsters. 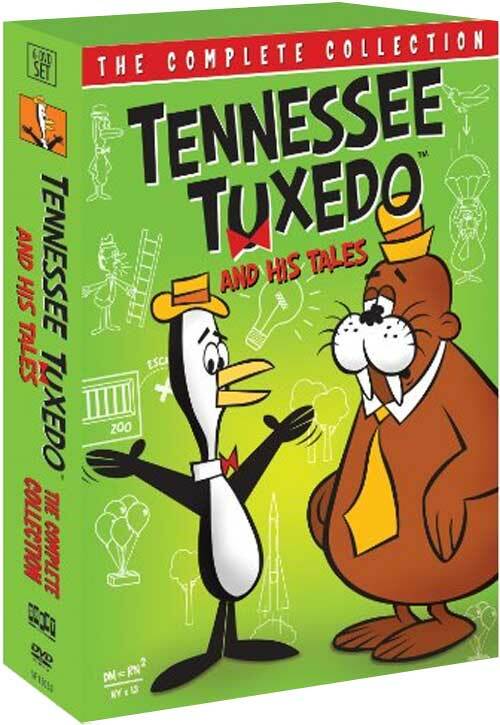 This 6-DVD set contains all 70 Tennessee Tuxedo cartoons for the first time in one collection, highlighted with the addition of many of the supporting segments of The King And Odie and The Hunter. As an added bonus, we have included episodes of Tooter Turtleand Klondike Kat to round out this classic collection of Total TeleVision animation.